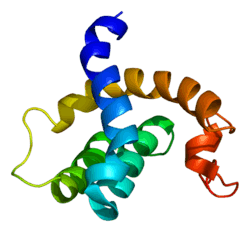 Protein CBFA2T3 is a protein that in humans is encoded by the CBFA2T3 gene. The t(16;21)(q24;q22) translocation is a rare but recurrent chromosomal abnormality associated with therapy-related myeloid malignancies. The translocation produces a chimeric gene made up of the 5'-region of the AML1 gene fused to the 3'-region of this gene. In addition, this gene is a putative breast tumor suppressor. Two transcript variants encoding different isoforms have been found for this gene, and a brefeldin A-sensitive association of RII-alpha protein with one of the isoforms has been demonstrated in the Golgi apparatus. ↑ Calabi F, Cilli V (Dec 1998). "CBFA2T1, a gene rearranged in human leukemia, is a member of a multigene family". Genomics. 52 (3): 332–41. doi:10.1006/geno.1998.5429. PMID 9790752. 1 2 "Entrez Gene: CBFA2T3 core-binding factor, runt domain, alpha subunit 2; translocated to, 3". 1 2 3 Hoogeveen AT, Rossetti S, Stoyanova V, Schonkeren J, Fenaroli A, Schiaffonati L, van Unen L, Sacchi N (Sep 2002). "The transcriptional corepressor MTG16a contains a novel nucleolar targeting sequence deranged in t (16; 21)-positive myeloid malignancies". Oncogene. 21 (43): 6703–12. doi:10.1038/sj.onc.1205882. PMID 12242670. 1 2 Amann JM, Nip J, Strom DK, Lutterbach B, Harada H, Lenny N, Downing JR, Meyers S, Hiebert SW (Oct 2001). "ETO, a target of t(8;21) in acute leukemia, makes distinct contacts with multiple histone deacetylases and binds mSin3A through its oligomerization domain". Mol. Cell. Biol. 21 (19): 6470–83. doi:10.1128/mcb.21.19.6470-6483.2001. PMC 99794 . PMID 11533236. 1 2 3 Goardon N, Lambert JA, Rodriguez P, Nissaire P, Herblot S, Thibault P, Dumenil D, Strouboulis J, Romeo PH, Hoang T (Jan 2006). "ETO2 coordinates cellular proliferation and differentiation during erythropoiesis". EMBO J. 25 (2): 357–66. doi:10.1038/sj.emboj.7600934. PMC 1383517 . PMID 16407974. ↑ Schillace RV, Andrews SF, Liberty GA, Davey MP, Carr DW (Feb 2002). "Identification and characterization of myeloid translocation gene 16b as a novel a kinase anchoring protein in T lymphocytes". J. Immunol. 168 (4): 1590–9. doi:10.4049/jimmunol.168.4.1590. PMID 11823486. ↑ Lindberg SR, Olsson A, Persson AM, Olsson I (Dec 2003). "Interactions between the leukaemia-associated ETO homologues of nuclear repressor proteins". Eur. J. Haematol. 71 (6): 439–47. doi:10.1046/j.0902-4441.2003.00166.x. PMID 14703694. Kitabayashi I, Ida K, Morohoshi F, Yokoyama A, Mitsuhashi N, Shimizu K, Nomura N, Hayashi Y, Ohki M (1998). "The AML1-MTG8 leukemic fusion protein forms a complex with a novel member of the MTG8(ETO/CDR) family, MTGR1.". Mol. Cell. Biol. 18 (2): 846–58. PMC 108796 . PMID 9447981. Gamou T, Kitamura E, Hosoda F, Shimizu K, Shinohara K, Hayashi Y, Nagase T, Yokoyama Y, Ohki M (1998). "The partner gene of AML1 in t(16;21) myeloid malignancies is a novel member of the MTG8(ETO) family.". Blood. 91 (11): 4028–37. PMID 9596646. Schillace RV, Andrews SF, Liberty GA, Davey MP, Carr DW (2002). "Identification and characterization of myeloid translocation gene 16b as a novel a kinase anchoring protein in T lymphocytes.". J. Immunol. 168 (4): 1590–9. doi:10.4049/jimmunol.168.4.1590. PMID 11823486. Kondoh K, Nakata Y, Furuta T, Hosoda F, Gamou T, Kurosawa Y, Kinoshita A, Ohki M, Tomita Y, Mori T (2003). "A pediatric case of secondary leukemia associated with t(16;21)(q24;q22) exhibiting the chimeric AML1-MTG16 gene.". Leuk. Lymphoma. 43 (2): 415–20. doi:10.1080/10428190290006242. PMID 11999578. Kochetkova M, McKenzie OL, Bais AJ, Martin JM, Secker GA, Seshadri R, Powell JA, Hinze SJ, Gardner AE, Spendlove HE, O'Callaghan NJ, Cleton-Jansen AM, Cornelisse C, Whitmore SA, Crawford J, Kremmidiotis G, Sutherland GR, Callen DF (2002). "CBFA2T3 (MTG16) is a putative breast tumor suppressor gene from the breast cancer loss of heterozygosity region at 16q24.3.". Cancer Res. 62 (16): 4599–604. PMID 12183414. Powell JA, Gardner AE, Bais AJ, Hinze SJ, Baker E, Whitmore S, Crawford J, Kochetkova M, Spendlove HE, Doggett NA, Sutherland GR, Callen DF, Kremmidiotis G (2003). "Sequencing, transcript identification, and quantitative gene expression profiling in the breast cancer loss of heterozygosity region 16q24.3 reveal three potential tumor-suppressor genes.". Genomics. 80 (3): 303–10. doi:10.1006/geno.2002.6828. PMID 12213200. Hoogeveen AT, Rossetti S, Stoyanova V, Schonkeren J, Fenaroli A, Schiaffonati L, van Unen L, Sacchi N (2002). "The transcriptional corepressor MTG16a contains a novel nucleolar targeting sequence deranged in t (16; 21)-positive myeloid malignancies.". Oncogene. 21 (43): 6703–12. doi:10.1038/sj.onc.1205882. PMID 12242670. Lindberg SR, Olsson A, Persson AM, Olsson I (2004). "Interactions between the leukaemia-associated ETO homologues of nuclear repressor proteins.". Eur. J. Haematol. 71 (6): 439–47. doi:10.1046/j.0902-4441.2003.00166.x. PMID 14703694. Ibañez V, Sharma A, Buonamici S, Verma A, Kalakonda S, Wang J, Kadkol S, Saunthararajah Y (2004). "AML1-ETO decreases ETO-2 (MTG16) interactions with nuclear receptor corepressor, an effect that impairs granulocyte differentiation.". Cancer Res. 64 (13): 4547–54. doi:10.1158/0008-5472.CAN-03-3689. PMID 15231665. Kumar R, Manning J, Spendlove HE, Kremmidiotis G, McKirdy R, Lee J, Millband DN, Cheney KM, Stampfer MR, Dwivedi PP, Morris HA, Callen DF (2006). "ZNF652, a novel zinc finger protein, interacts with the putative breast tumor suppressor CBFA2T3 to repress transcription.". Mol. Cancer Res. 4 (9): 655–65. doi:10.1158/1541-7786.MCR-05-0249. PMID 16966434.